So today is my husband’s birthday. HAPPY BIRTHDAY JEFF! Excitement aside. We had a mostly vegan BBQ, my husband is an ominivore so I let him have his steak tips and hamburgers (because everything else he ate was vegan and he was very forgiving of my mood swings when I was detoxing off dairy and meat, I cried over Mac n Cheese once, It was pathetic). But vegan-wise… I made vegan beer brats, vegan hot dogs, chili, rice, baked russet potatoes, steamed veggies, a nacho dip, and a spinach artichoke dip with all the edible dipping tools one could ask for. I will try to post my recipes for those dips later this week as they are delicious! So for dessert, what room there was left for dessert, was filled with the smell of warm milk chocolate and freshly chopped strawberries. I usually add guava with his chocolate cake and a dash of cinnamon but the store didn’t have any. So, I made a delicious half homemade milk chocolate cake with a spruced up strawberry frosting. I took plain white frosting that was “accidentally vegan” and added strawberry preserves from a local farm and freshly chopped strawberries. The only issue I ran into was I could smell them baking in the oven nearly tasting the melted chocolate chips when I snuck a peak and saw the tops of them exploding and chocolate chips oozing over the top. I panicked for about 10 seconds contemplating pulling them out as they seemingly deflated and then said to my inner self “just wait until the time is up and they are cooked and test them”. When I brought them out it was like magic! The chocolate had formed a crunchy layer across the top similar to a carmelized creme brulee and the inside was soft and moist with little pockets of melted chocolate. The best mistake ever. S0, I will now share the recipe of my delicious mistake with you! So I started by making the frosting which one would think would be the last step since the cupcakes take about 25 minutes however, due to the heat lately, I needed to refrigerate the frosting so it would firm up. 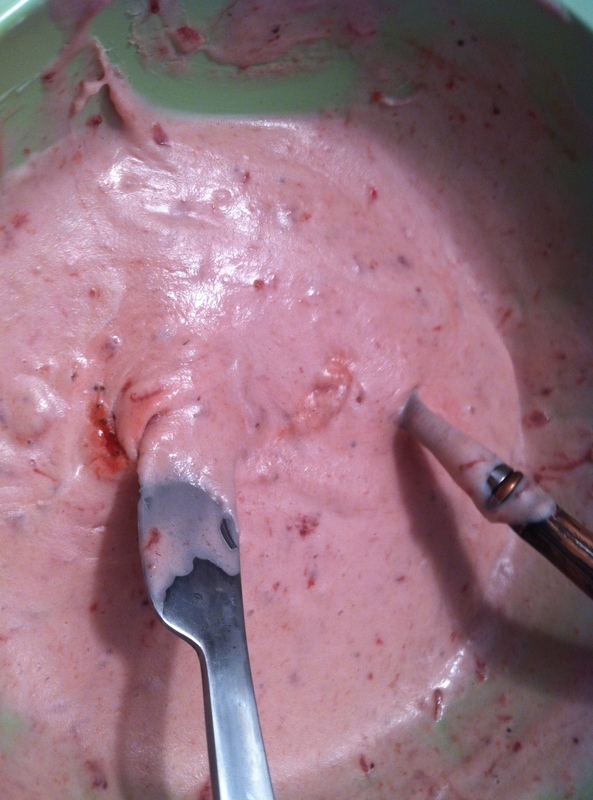 First combine the white frosting and the preserves then after it has a good flavor (testing is the best part) and is well mixed add the fresh cut strawberries until they are evenly mixed in. Refrigerate. The flavor will intensify as it sits. Next, make the egg replacer mixture in a small teacup or mixing bowl. Then in a large mixing bowl place in Chocolate Cake powder mixture. 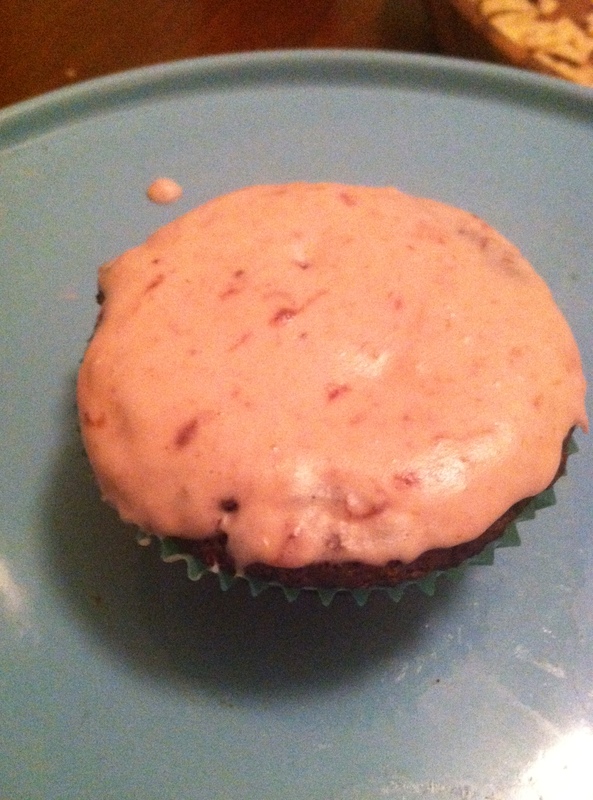 Grind the flaxseed powder in a coffee grinder and add to the Cake Mix. Next, add soy milk and oil to the cake mix. After it starts to get wet and combined add the egg replacer mixture to the cake mix. Once everything is well combined and a little thick, add the chocolate chips. Mix well. Finally start placing the cupcake batter into the lined tins. 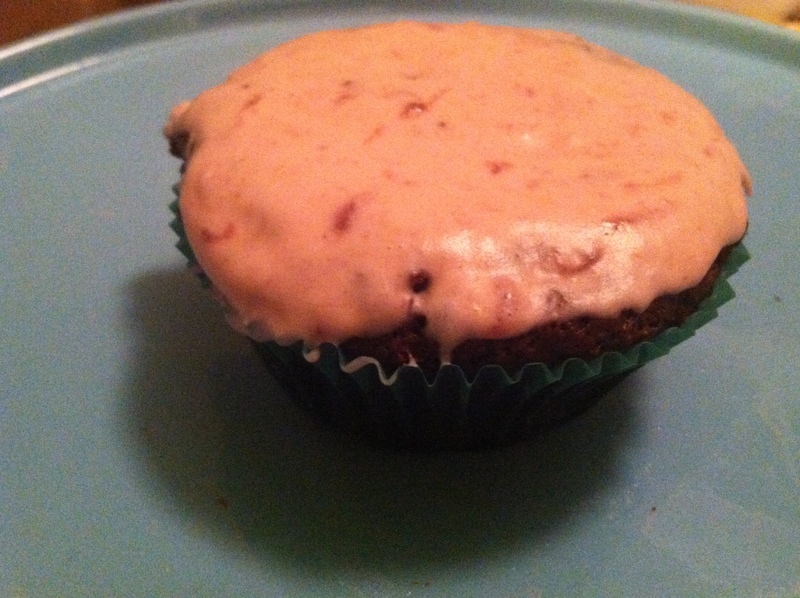 I use cupcake paper cups so that the chips don’t stick to the pan and make my cupcake fall apart. Place first tray of cupcakes in the oven for between 20-25 minutes. When taking them out use a fork to slide down the side of the cupcake between the paper and the pan to lift them out and place on a cooling tray or rack. Let cool at least an hour before frosting as the chocolate chips will explode onto the top forming a delicious crunchy layer that is more like lava at first! My cupcakes got a little melty with the frosting because of the weather being about 95 degrees and the cupcake being warm still. PS If you want to get fancy for a holiday add a heart-shaped strawberry slice on top for Valentines Day or a Chocolate Dipped Strawberry for an Anniversary or a Strawberry Lollipop in the Center for a Little Girls Birthday or Baby Shower! In preparation of the Fourth of July I have found I need two things 1. Produce and 2. A Sharp Knife. It has been a hot summer here in the Boston area and knowing this I always prepare lots of cut fruits and veggies that are placed in glass containers in my fridge for snacking or for easy food preparation. After going to the grocery stores and Costco yesterday I came home to chop all my new finds up. I have 3 containers of cucumbers, 1 very large container of tomatoes, 12 chopped apples in a mixing bowl with lemon juice for pie, and 3 containers of strawberries. I felt good about this because when traveling over the fourth of July and surrounding days I see a need for cool raw items like fruit and cutting it up just makes it more accessible. The other day I went through 2 cartons of chopped strawberries from Saturday’s farm stand because of a Graduation party. If they had not been so accessible I may have just gone and lazily bought something. Instead my vegan version of a Fruit Trifle went over so well it was empty within 1 hour. The grocery store cake was barely missing a third of its frosting. So with that I am going to give you my trifle recipe and hopefully you will take that to the next fiesta you get invited to this summer as well as my tips to remember to “chop, contain, and take away” all those delicious fruits and veggies you buy each week. The 30 minutes it takes to do them all after shopping saves so much time later that week when you are in a hurry! START: Make the yellow cake per the box specifications adding 1 egg worth of egg replacer and 2 eggs worth of powdered flaxseed (2tbsp). I use two circular cake pans and fill each half way. Bake until slightly browned and allow to cool before starting trifle. CREAMS: In separate bowls, begin mixing the ingredients outlined above for each of the marscapone and whipped creams. For the whipped cream take only the white coconut cream substance from the can draining away any liquid before it goes in the bowl. 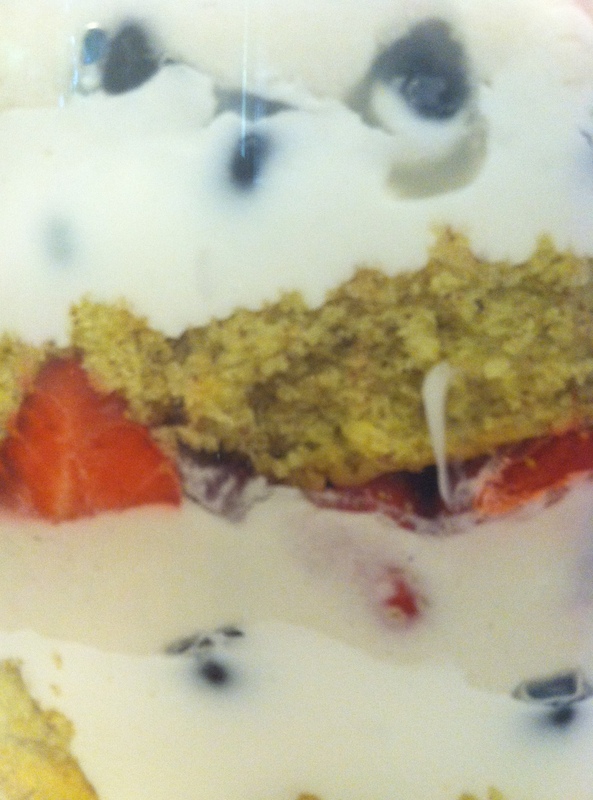 You can double either recipe for more thick creamy layers to the trifle if you have a larger trifle bowl. Whip both until thick and place into the refrigerator while you wait to prep the rest of the trifle. 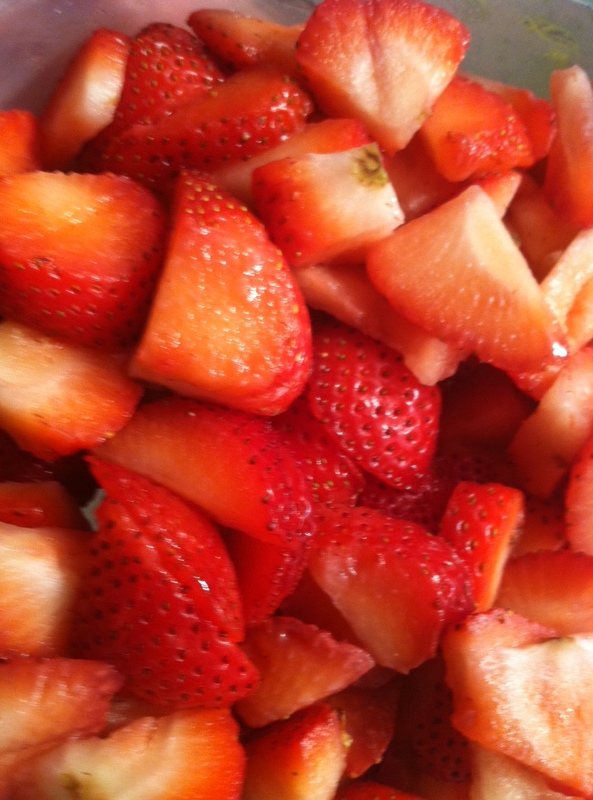 FRUIT: Chop the strawberries into small squares about the same size as a large blueberry. Blueberries can remain as is for layering. MAKING THE LAYERS: I start the bottom layer with lemon cake. I trim the edges that are crusty off first and then slide to the bottom of the trifle bowl. I then top it with 1/2 of the marscapone cream. The next layer is of 1/2 of the blueberries. 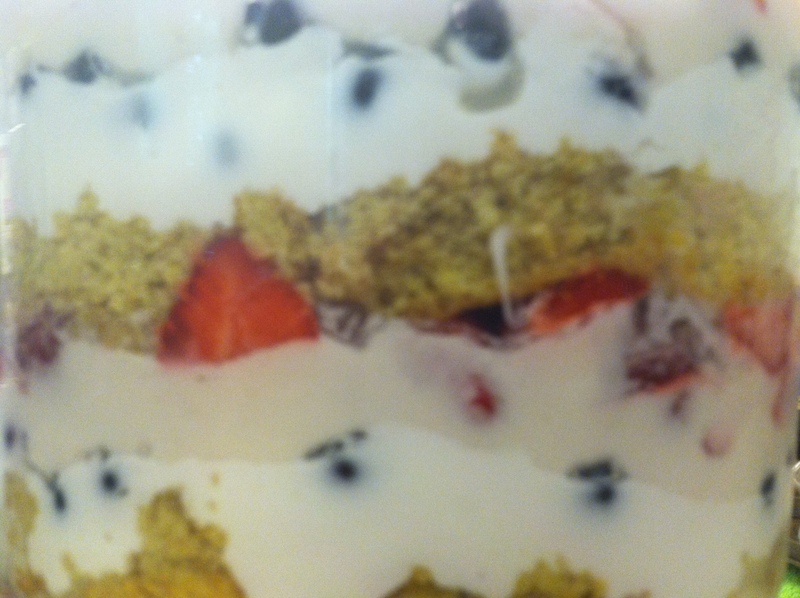 Then 1/2 of the whipped cream on top and last a layer of 1/2 of the chopped strawberries. Then repeat the whole set of layers. 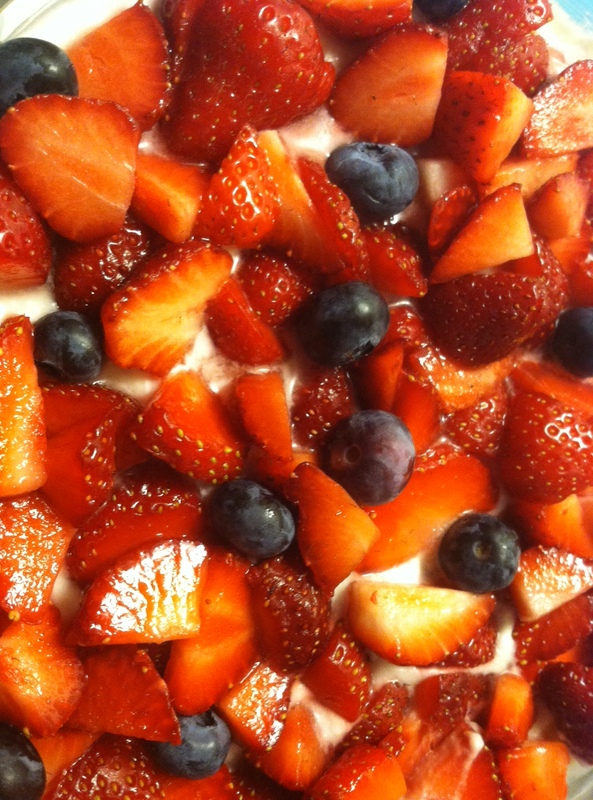 I save a few blueberries to sprinkle with the strawberries on the top layer as well since it is exposed. Refrigerate until it is time to serve. Enjoy! PS: This was a crowd pleaser to even non-vegans (since I am the only one that was at this party). They were whispering about it outside and talking to my mother about how talented I was. 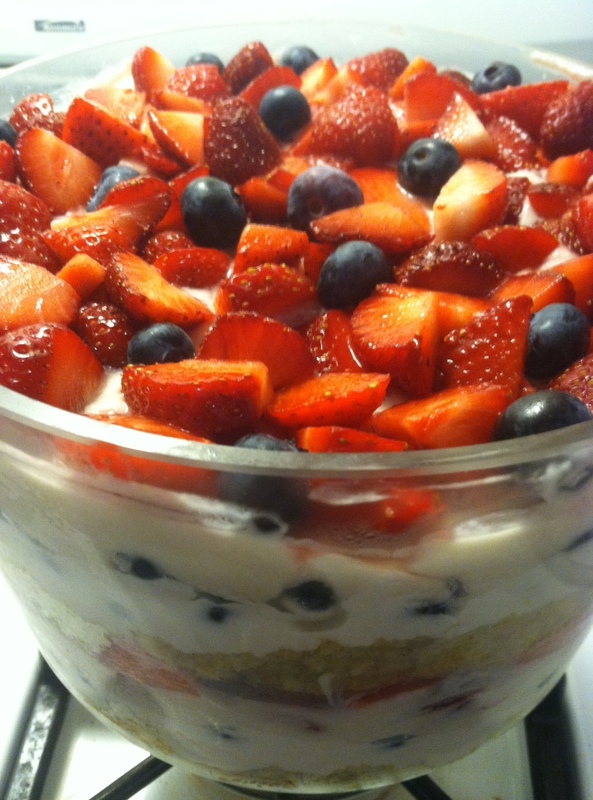 It is too simple to be talent so sneak around telling everyone you are an amazing chef and whip this up tomorrow morning for your Independence Day party!